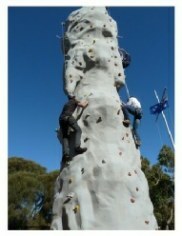 In Jan 2012 Bimbi Park installed a state of the art Rock climbing structure. Frank, Kat and the boys saw a small portable one at a festival and thought it would be a great addition to the activities in the park. As usual Frank went over board and with Michael from Flashpoint Sports designed a monster. It has 4 auto-Belay systems, a timer on each climbing station and cameras mounted on the top that take pictures of the climbers. This is not a toy, but a serious, challenging climbing structure, that is suitable for all ages and skill levels. Our tower has been built with your safety as the highest priority. It was built in Victoria by an Australian company and complies with all current Australian regulations. There are 8 separate tracks, ranging from easy to extremely difficult. As we need to have a staff member supervising the climbers, bookings are recommended. Long weekends and school holidays we’ll have a program on our site. Cost is about $15. Most people can climb it. Frank who’s built for comfort not speed can do it. We have many school groups stay at Bimbipark. Bimbipark is accredited with the Australian Camps Association to accommodate students of all ages. 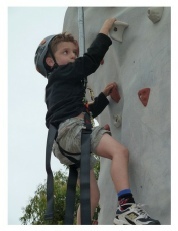 Your school can book a climbing session including a photo of each climbers attempt for $15.00 per student. Schools use us for full camp programs or just an overnight stop during their journey. Activities we can help you with include: Cape Otway Shipwreck walking tours, Mountain bike riding, Argo trips, Snorkeling, surfing, sea kayaking, marine walks, raft building, Indigenous talks, Horse riding, Otway Treetop adventures and many more. Call us with your schools requirements so we can write a program to suit your schools budget and objectives. Click here to use our contact form with your details. You can have an event like a birthday party here. 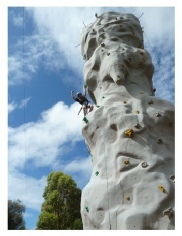 You can also have a photo taken of your climb. There are cameras mounted on the top of each climbing station. If you are a group we can customise the details on the bottom of the photo to remind everyone of their adventure eg. (Dimitri’s 9th birthday 2011). This system was put in by Digital Photo Industries. Lynton did a great job. Who built our climbing tower? Flashpoint Sports built our wall. 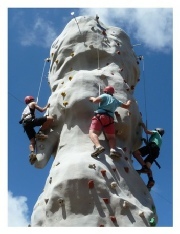 They are a Victorian company with many years experience in rock climbing walls. They are at the forefront in design and manufacture and excel in engineering, quality, service and Safety. “Belaying” is a climbing term that describes the process of taking up slack in a climber’s safety line as they ascend, and then safely lowering the climber when they either fall or wish to descend. In traditional rock climbing, this process is managed by a “Belay Partner”. The term “Auto-Belay” is used to describe a device that replaces the “Belay Partner” with a mechanical device. Which Auto-Belay system do we have? We chose Spectrum Sports auto belay system. Spectrum Sports is a company that has been behind the auto-belay climbing movement from the very beginning. They pioneered the technology and built the very first hands-free auto belay device for climbers in the ’90s. Since then they’ve been safely protecting climbers from falls using their advanced automatic belay device. They have more experience with auto-belays than any other company. How does the Auto-Belay work? The Spectrum Sports auto belay safety system is an air/oil hydraulic apparatus. As a climber ascends, air pressure works upon the device in a manner that collects any slack in the climber’s safety line. When the climber descends, oil flow thru the device is restricted in a manner that safely slows the rate of descent. Four generations of design evolution, 3rd party engineering, and millions of safe cycles worldwide have proven that the Spectrum Sport Intl Auto-Belay device is the safest and most reliable on the market.